Do GPU upgrades always speed up pro apps? Before you upgrade your GPU or double up on GPUs, it helps to know if it will make a difference no matter what pro app you run. We used three pro apps to illustrate this point. Test Mule was a 2010 Mac Pro 12-Core 3.33GHz Xeon X5680, 96GB of 1333MHz DDR3 memory. NOTE: Results for the GTX 1080 paired with GTX 1080 Ti were removed when I discovered an efi error in the unflashed 1080 Ti that hampered performance. 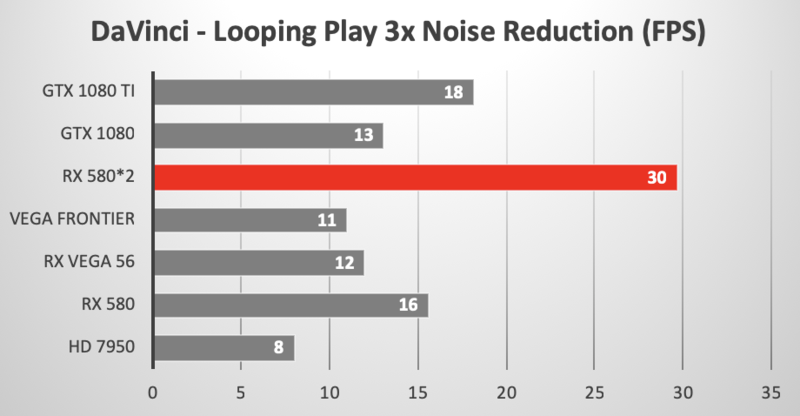 The dual NVIDIA GPUs should have produced a looping playback as fast or faster than the dual RX 580s. In the case of DaVinci Resolve, faster GPUs (and multiple GPUs) do not speed up every process. If a process is CPU heavy and ignores or only makes limited use of the GPU, there will be little or no boost from a faster GPU. 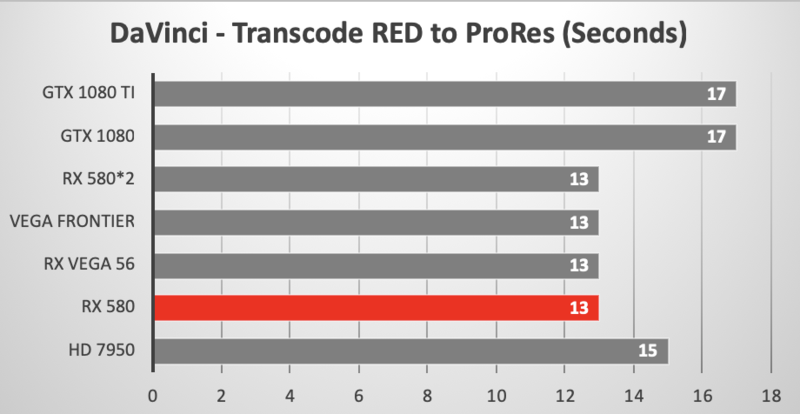 One example of this is graph #2 showing Resolve using the Deliver panel to transcode the 5K RED clip to 5K ProRes 4444XQ. NOTE: Results for the GTX 1080 paired with GTX 1080 Ti were removed when I discovered an efi error in the unflashed 1080 Ti that hampered performance. The dual NVIDIA GPUs should have produced a looping playback as fast or faster than the dual RX 580s. In the case of Motion, faster (and multiple) GPUs make a significant difference in completing the render of RAM Preview. 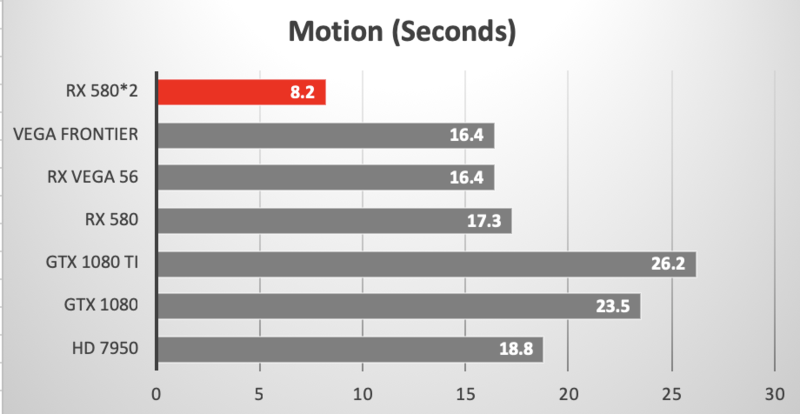 And, again, NVIDIA GPUs are at a disadvantage running both Motion and Final Cut Pro. We featured the 2010 Mac Pro tower in this testing session. 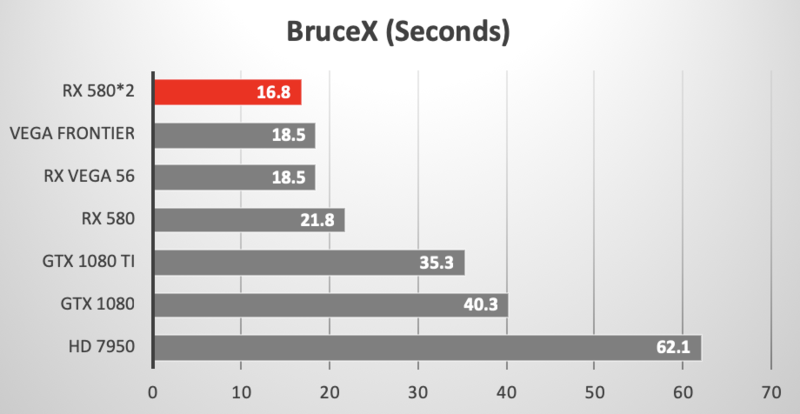 When we tested the same combination of AMD GPUs connected to the iMac Pro there were more surprises. Let's just say that the 'obsolete' 2010 Mac Pro is still useful for running pro apps. We found the AMD Radeon RX Vega 56 on NewEgg. Check eBay for all models of Vegas new and used.